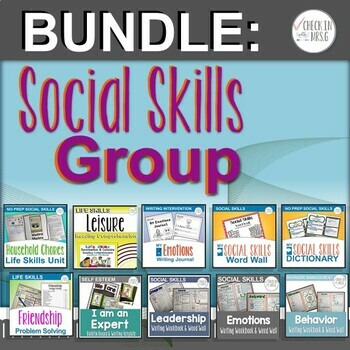 Social Emotional Skills Bundle that combines social skills lessons in ELA activities. Works perfectly in special education, resource, and social skills groups. This bundle is ideal for a teacher who works with students across a wide range of abilities who are all developing social skills, transition skills, and learning to take on more responsibilities. Click on the individual pictures to see detailed information about each product included!